PVCStrip.com has a complete line of welding screens that offer a safe, easy-to-install and effective solution for separating welding stations from other work areas. Welding curtains are available in several configurations to fit a variety of applications. A properly installed welding curtain or welding screen will help protect workers and the work area from the hazards associated with welding such as sparks, spatter and ultraviolet light. 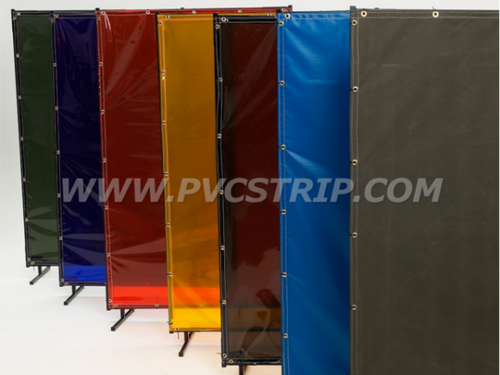 PVCStrip.com offers welding screens and welding barrier material that can serve as free-standing panels or PVC vinyl curtains. Free standing welding curtains may include optional caster wheels to provide added mobility and portability. Welding screen material can be purchased individually or in a bulk roll. It should be noted that welding screens and welding curtains cannot be substituted for proper eye protection. Welding screens come in several colors including olive drab duck, grey transparent, yellow transparent, orange transparent, blue transparent and green transparent. The buyer can choose to purchase the weld screen with or without grommets on one edge. Specialized hardware can be provided for those wishing to build customizable work stations. Weld screens are available in sizes ranging from 4 feet wide by 6 feet high to 6 feet wide by 8 feet high. For questions regarding weld screen applications, please call 888-303-8515 or contact us.